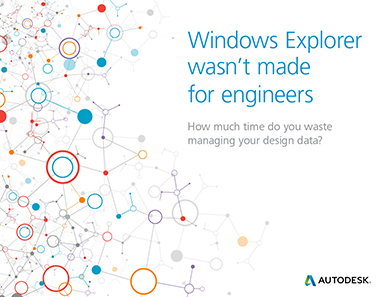 How much time do you waste managing your design data? Engineers spend, on average, 15 percent of their time managing data—and some routinely waste the equivalent of one day a week or more. To overcome these challenges, you need a file manager that’s made just for engineers. It should understand the complexities of CAD file relationships, help you find the files you need when you need them, and, most important, make it easy for you to collaborate with your colleagues. Product Data Management (PDM) exists just for this purpose. This guide outlines the different ways Windows Explorer can undermine engineers’ productivity, and illustrates how a solid PDM strategy can help your entire team spend more time doing what they do best.